An indie game with brimming action and speed, as predicted, is something a gamer like myself is getting very excited about. The overwhelming retro-vibe that the developers, being Tri-Coastal Games, showed before the release, caused the necessary interest for every retro gamer. Tri-Coastal Games is two guys from Canada who are passionate about making indie games. At first, the works began in 2014 on a game called “HillVille”, what had to be a sci-fi story with the necessary action and adventure elements. The developers, Craig Grierson and Daryl Wilson, understood very quickly that more manpower was needed to finish this particular game. The project was put on hold, so the two gentleman could fully focus on “Dystoria”. Craig and Daryl share a goal to create innovative, original and engaging games, as the description says on their website. Let’s wait and see if “Dystoria”, which was released on February 21th 2017, is just such a game. Hillville – Canada, July 14th 1984. That’s where the story of “Dystoria” begins. 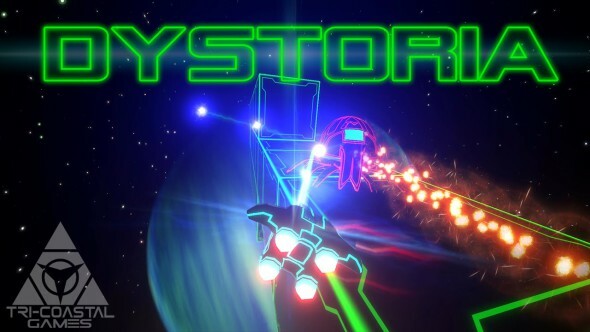 A young man is strolling down the streets when he finds the arcade game “Dystoria” behind an abandoned warehouse. Intrigued by the colors and sound of the game, he steps towards the arcade, slides in a coin an starts playing “Dystoria”. Just when he wants to play the first stage, a strange sound echoes from the sky. As out of nowhere, a UFO hovers above the arcade and exudes a light beam on the arcade and the player. Before he can understand what is happening, he is being abducted. When he wakes up, he’s inside the UFO and can start to figure out why he is chosen to be taken by the Alien spacecraft. A computer informs him that he is chosen to test “Dystoria”, which is an elite training program. People all over the world are being chosen, just like our player, to be part of this program and fly different types of spaceships, in different kinds of setups and worlds. From that part on, the game flow takes up in pace. The info is clear and you can start customizing your spaceship, enter the first stage of the first planet and start blasting away. On the graphical aspect, there’s a real retro/flight simulator feel. The colors are bright and have a futuristic touch. The spaceships, enemies, drones, cubes,… are looking very smooth. The game seems to have little detail, but that doesn’t seem to bother. In the idea of “less is more”, Dystoria’s graphics are more than acceptable, which is also the story behind the computer/menu where you can choose and customize your spaceship. The additional adding of planets and stars really are a plus. Also, the main menu has this futuristic/sci-fi look, although it remains a simple yet clear layout. The main focus remains retro, which is the real key word throughout this game. 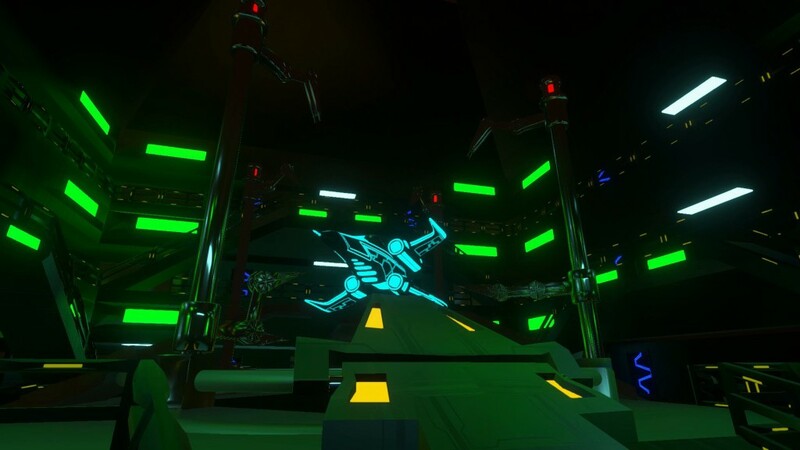 There’s a similarity with the game “Tron”. Especially on the color part and futuristic look. Although “Dystoria” doesn’t work with as much with shadow effects. Here’s where Dystopia really scores. The main theme is so catchy, it stays in your head for days. The retro/synthwave tunes, almost sounding like a ringtone on an old cellphone, are blasting you straight back to the good old days where a game stood or fell with a fitting theme sound. Besides the tunes, there’s a cool robot-like, female voice that assists you while flying your spaceship. Pronunciations like “orb”, “portal ready”, “sector complete” and “shield critical” are sounding amazing. The developers really spent the proper amount of working hours to perfect this rather important, yet sometimes forgettable, aspect in game developing. Like the graphics part, “less is more”, again is the correct term sound wise. It just works and fits together perfectly. As mentioned before, Dystopia is an indie/action game with a sci-fi touch but where the retro aspect stands above all. Right from the main screen, simplicity prevails and you get that futuristic/sci-fi vibe straight away. You can easily setup your gamepad or keyboard controls before you start your adventure. There are 4 levels of difficulty, starting from “easy” and going on to “insanity”. After the abduction by the UFO, you find yourself in a control room where you can access your computer for info and another one to customize your different spaceships and start the level.After that, your journey starts in “Kryoccian”. Here you face 7 stages before you travel to another planet called “Zuzuli”. Again, after 7 stages, the adventures goes further as you discover “Solterria”. When you clear all the stages of this planet, the story goes on in “Embryis”, which is the final planet you must conquer. This world has an additional stage, making it to a total of 8. 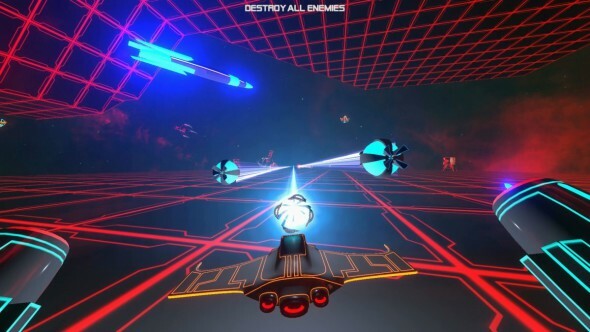 The main thing you do on each planet is clearing the different stages by collecting orbs, finishing of enemies with your laser beam and bombs and opening the portal by doing so. It seems easy, but let me assure you, it really isn’t. The game is extremely fast and you need to think and act quickly by flying your spaceship with a unique style of 360 degree axis shifting gameplay. 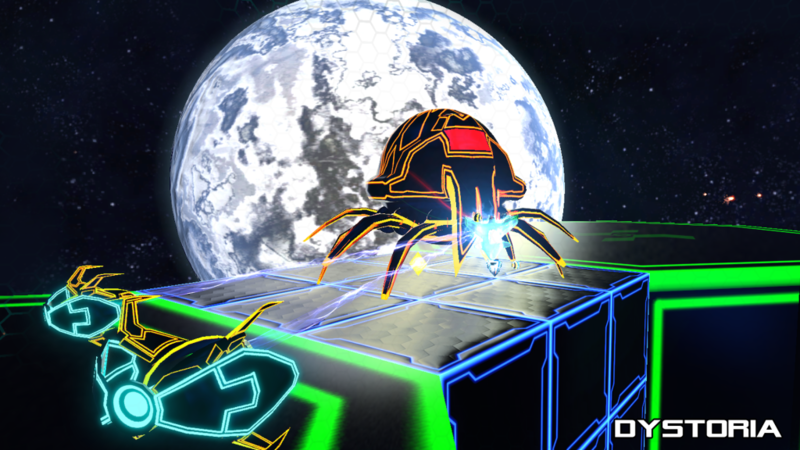 It’s really fun to swirl around the cubes and change the perspective of the stage you’re battling in. On the other hand, it’s rather clear you don’t play this game in a drunken or fuzzy kind of state, as you will surely feel nauseous after just a couple of minutes. You must be alert at all times if you want to clear the stages and travel further. The nice thing is, that there’s a lot of variation on the stages and the way you need to act to clear them to travel further. On the downside, when you want to start a new game, it erases your old save game, which can be frustrated when you share “Dystoria” with other family members or friends. The developers didn’t exaggerate when they said they made an innovative, engaging and original game. You will have a lot of fun when playing “Dystoria” and will surely be hypnotized by the synthwave/retro soundtrack. It’s hard to point out flaws or minor points, as the game is just perfect in its simplicity and style. Retro gamers, like myself, who played the old arcades when they were young, will embrace and love this game.